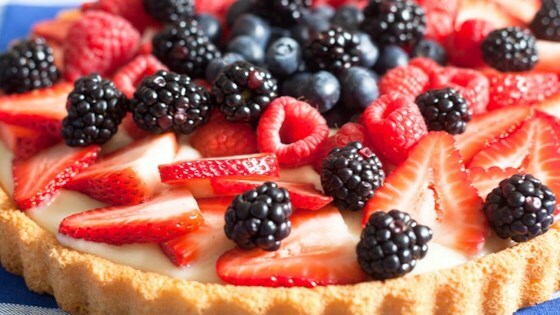 "Bring summertime flavor anywhere with this easy mixed berry tart with almondmilk vanilla custard." To make custard whisk egg, corn starch and maple syrup together in a pan. Slowly whisk in almond milk over medium heat. Bring to a boil, whisking continuously, remove from heat and cool 5 minutes. Pour custard into tart crust and top with fruit. Not sweet enough. Very bland filling. i used half heavy cream n half almond milk. was a hit! This recipe is quick and easy to make, but delicious. Only change i made was that I had a recipe for a homemade sweet tart dough so i used it...Cant wait to make this recipe again, thanks!